Winter season is already knocking the doors in many parts of the world, which brings lots of changes. Be it with food habits, skin, clothing, and of course a change in our routine too. We all like to stay warm and cozy in winters and have hot cup of soup or coffee and spend the days calmly. Yes a winter brings along a sense of calmness and peace along but our routine of work and house has to go on in similar manner, season just changes the way we lead our schedule. Winters definitely make it little difficult to step out of our house for things that are not dictated. Most of us start our day with a brisk morning walk and exercise in the fresh air but the cold climate makes it challenging. Certainly we may not like to take a break from our fitness regime but surely can try a new alternative approach. A fitness approach that gives us same energy and steadiness as walking or outdoor activity is thing to ponder on. Though one exercise form can’t be replaced by another but can tried to be substituted. And with Yoga, all can be achieved if one is regular in his/her sessions. Yoga can be completed indoors to stay refreshed and energetic during the cold shivering days. It’s great to start off with something different and healthy routine. 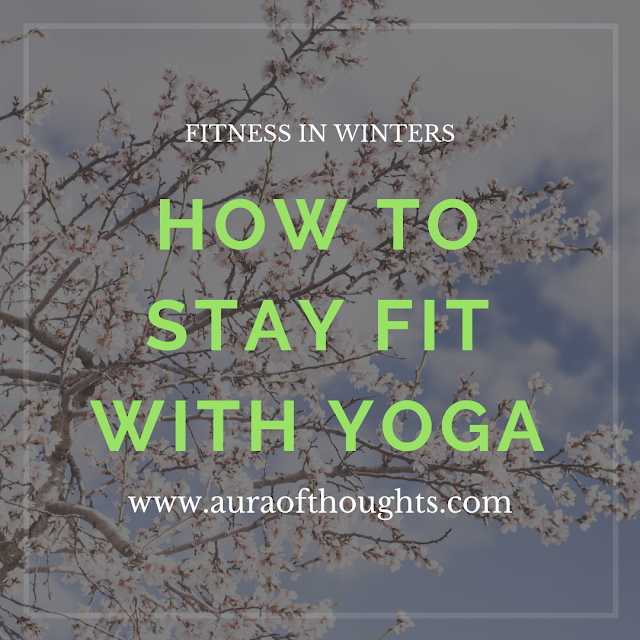 If you are looking for more reasons to start with yoga then these pointers will surely help you to make Yoga as your priority in healthy lifestyle. Sometimes we get bored of the monotonous workout routine preventing our full participation. And winters give us the time to choose a change that is so refreshing. To stick to the workout goals we should definitely try to perform meditation and yoga exercises, such routines gives us mental peace and better approach towards life. One good reason is unquestionably the difficulty in stepping out in chilled morning winter air. To maintain the timing from our busy work routine one may prefer to stay indoors and practice yoga instead. An apt yoga mat, which is handy, will surely help us to stick to our postures right. So your indoor fitness regime will make you feel more energetic and will boost your confidence to brave the air. The winters are the best time to kick-start with your regime for building great flexibility of your body. Yoga helps to regain the flexibility as their posture helps to sway body parts in directions that build your stamina. Winters are the time to hibernate to slow down but we can welcome this season with exceptional energy by changing a few workout routines. A perfect little place indoors with a handy yoga mat of your favorite color and texture will not let you miss your exercise routine. Grab one through online stores if you don't want to step out to buy one. Active schedule definitely makes sure for active day ahead and yoga gives the boost start. Yoga is the best exercise for body, mind and soul..it can be done even while sitting at home ..so nothing can stop from staying fit if we are regular at yoga..
Agree Ritu, regularity is what yoga longs for. Nothing can beat the long lasting benefits of yoga! A natural way to becoming fit and strengthening your immunity! Winters are indeed challenging taking into consideration the high calories intakes and restricted mobility! Yoga at such times is the savior! I feel like going out for long walks during winter season because it brings a nice shine to my face plus it's minus grime. It's great that you can make it winters too, my routine completely changes as I can't brave the cold. Calmness is one of the main feature of Yoga, that gives us strength to look forward for the day. It is good that you enjoy the best form of exercise that makes your day enjoyable.